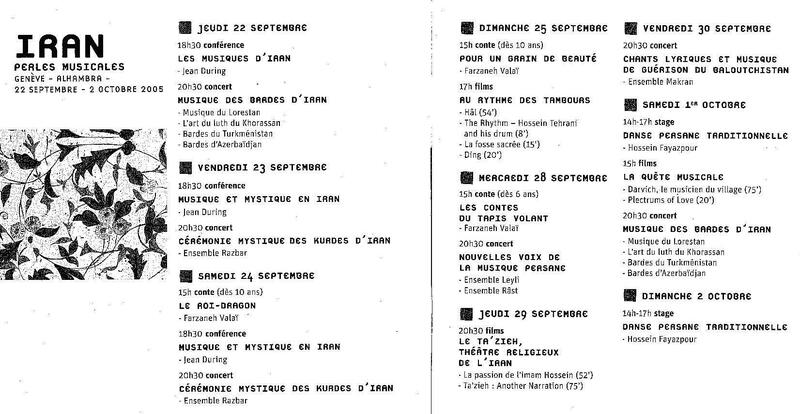 his festival was organised with the scientific and artistic collaboration of Jean During and Mme. Leyli Atashkar of Tehran and conceived to represent the diversity of regional music in Iran with performances of Khorasani, Lori, Turkmen, Baluchi, Azari and mystical Kurdish. After the Geneva performance, the festival was scheduled to tour other locations, including destinations in Belgium, France, Germany and Italy. Performances were conducted by musicians from Iran.